Tarek Al-Ghoussein is an artist based in the UAE. His work has appeared in international exhibitions throughout Europe, the United States and the Middle East. His work is also featured in several anthologies and a monograph on his work In Absentia was published by Page One and The Third Line in 2009. Al–Ghoussein’s work is in permanent collections at the Solomon R. Guggenheim Museum in New York, the Victoria and Albert Museum in London, the Royal Museum of Photography in Copenhagen, Darat Al–Funun in Amman and Mathaf Museum in Qatar. In this interview for Ibraaz, the artist explores the development of his work and how, through the form and technique of the self-portrait, it engages with preconceptions of what is meant by ‘Arabness’ in the eyes of both Arabs and non-Arabs alike. Al-Ghoussein also addresses what he considers to be a failure of sorts in his early photojournalist work and how his later body of photographs attempts to unpack what is meant by belonging and identity in a region where such ideals are not only beset by glib media representations but are also underwritten by the popular stereotypes of Arabness that circulate throughout the Middle East and beyond. Anthony Downey: The very first work I saw of yours was War Room (2004), and I think I saw this in Sharjah in 2005. Could we talk a little about this, as it stands apart from your subsequent work, but I think certain elements in it come through in your more recent work. Tarek Al-Ghoussein: Yes, I had two projects at the 2005 Sharjah Biennial, and War Room was one of them. During the first Gulf War in 1991, I was in Egypt and travel was very difficult for me. I was following developments on television and began documenting the reporting with a Polaroid camera. After the images were first exhibited, someone wrote about the work and referred to me as a ‘poor suffering Kuwaiti artist who was reacting to the war’ – nothing could have been further from the truth, as I recorded the events from the comfort of a hotel room. Seven years later, after moving to Sharjah, the Iraqi invasion of Kuwait occurred and I returned to the same format of documenting the televised coverage of the events. It was at this time that I began to notice the similarity between reporting on the conflict and other representations of the war, such as in movies and cartoons. I started discussing this with a colleague, Chris Kienke, and we began to work together on documentation. In thinking about exhibiting the work, we ultimately decided to arrange the images randomly using light boxes, which allowed the viewer to be immersed in the glow of the images in a manner similar to television viewing. AD: There are two things that interested me about this work: there seems to be an issue around the homogeneity of representation but equally there is a very formal engagement with imagery and the representation of images. I don’t know if that resonates with your thinking about it but that re-presentation of images of war seems to be quite interesting. TAG: Sure, the homogeneity of the images, regardless of their source, relates to the tendency to treat all references to war (i.e., cartoons, film representations, coverage of actual events, etc.) in the same manner and I found that very engaging. Tarek Al-Ghoussein, Untitled 3, from Self Portrait Series, 2002-2003, digital print, 21 5/8 x 29 1/2 inches (55 x 75 cm), edition of 6. Courtesy and © Tarek Al-Ghoussein. AD: The other element that came out of that work was the way in which it engaged with stereotypes and the stereotypical imagery of the war itself. I see this re-emerging as a component of your Self-Portrait series. Could you talk a little bit about that in relation to this series? TAG: Yes, of course. I have spent a great majority of my life outside the Middle East before coming to teach at Sharjah. I lived in Japan, America and the UK. I am very much an Arab but my upbringing was characterised by significant exposure to the west. What particularly bothered me during this time was the perception of the Arab – especially in the media – and I wanted to address that. It was always the Palestinian terrorist or the Arab terrorist, which denies the ability to form a nuanced view of individuals. I also found it strange that we were considered the terrorists while others were ‘freedom fighters’, although both ideals share similar historical situations. The journey of the keffiyeh as a symbol of Arabness or Arab identity offers a way for me to address these issues. The keffiyeh was a very potent image because of Yasser Arafat’s appearance in the media. Perhaps Arafat’s representation as a military figure was instrumental in propagating the assumption that the Palestinian cause was connected to only military action. Therefore, the keffiyeh was used as a starting point for the self-portraits. That early body of work is probably my least favourite, unless the images are shown together as a group. Many people tend to treat the images superficially, believing that they represent a ‘terrorist’, but for me, these images work together to create a more nuanced narrative when they are in a group. The relation between the images allows other stories to emerge. AD: Is that reflected in the formal composition of those images? Because they remind me of Bernd and Hilla Becher, that new objectivity approach to photography that is very much about framing and the objective sensibility being used in the taking of the photograph itself. TAG: I’ve never heard that reference but it’s very interesting and makes sense. The New Topographics movement from the 1970s influenced me greatly. I am sympathetic to the issues they were addressing. One thing about my early work is that it is very concerned with formal structure and I think there is a connection to the Bechers’ work in terms of composition and formal awareness. AD: One of the things that strikes me consistently in these images is that the figure remains alone. It is therefore very illusive, difficult to pin down as a social fact, and it is also allusive in the way that it suggests a narrative. 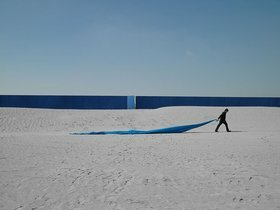 It is not just simply the image of a man with a keffiyeh in a desert: these images suggest a before and an after, some sort of narrative directs our attention to something beyond the frame of reference that we have in the photograph itself. Does that resonate with your thinking on these images? TAG: Absolutely. Some viewers tend to look at the image in terms of mere content rather than framing, but for me what comes before and after the images – their extended points of reference and the suggestion of something else – is very important. AD: Do you think that is reflected in other elements in these images? We seem to be on the verge of something between destruction and reconstruction. I see a lot of building materials that have either been dumped or are part of a building in process – although that is not made clear – and that would suggest an allegorical reading of these images. TAG: I’m glad you picked up on that. That hasn’t been discussed at all yet in relation to my work. I am very interested in the relation between construction and destruction, but in the line between what is true documentation and what is created. I am also interested in what is found and what I bring to the formation of the scene. I look for places in a way that I would imagine a film director does. The references in these images are conceived of as sets for me, something to construct and perhaps deconstruct. AD: Whenever I think of the mise en scène in your images – the way in which the protagonist is put in the scene – I also think of mise en abyme, a term used when you face an abyss or are placed between two mirrors that refract reality into the distance. This is a comment more than a question, but when we are looking at these images there is a consistent questioning of the viewer’s position – a placing into an abyss of interpretation – that questions any easy assertions or understanding of what it is we are looking at. TAG: I appreciate the comment as it relates to my intention to make images that result in multi-dimensional interpretations. AD: I am going to turn the conversation to something else. One of the things I find perhaps a bit disconcerting is that very few commentators talk about the formal component of these works as art. They seem to be consistently positioned as being about something that can over-politicise their import. Can you talk about the performative element at work here, because I think this is critical? I see these works as drawing on a history of performance art – a sense of being in a specific environment – as much as they draw upon a Palestinian/Arabic identity. TAG: One of the reasons I stopped using the keffiyeh in these images was that I became suspicious of an over-reliance on Palestinian identity. I remember I had an exhibition at the Third Line Gallery in Dubai, and a writer from The National newspaper asked me: ‘How does this relate to Gaza?’ Everyone keeps looking for that – the commentary on Palestinian identity – and I felt like it was both too restrictive and too simplistic. An anonymous figure allows a greater interpretive range. I was also thinking that focusing on the performative element may also be too restrictive. I would say that the work is more about intervening or interacting with what is found in a particular place. Tarek Al-Ghoussein, Untitled 2, from Self Portrait Series, 2002-2003, digital print, 21 5/8 x 29 1/2 inches (55 x 75 cm), edition of 6. Courtesy and © Tarek Al-Ghoussein. AD: One image I was very taken by – and this may take us to a political reading, although I am hoping to get away from such a deterministic reading – is Self-Portrait No.2 (Looking at Palestine) (2003). Obviously there is a reading there that could be political but the image I am most reminded of – and I don’t know if this was conscious on your behalf – is Caspar David Friedrich’s Wandered Above the Sea of Fog (1818) and the anonymity of that individual in Friedrich’s painting, standing as he does staring into what is a sublime backdrop. I was also taken by the fact that the sublime, for Edmund Burke, is as much about fear in the face of nature and history as it is about exultation. Does that resonate with your understanding of that image? TAG: Some of the things you talk about came much later. I didn’t know Friedrich’s work at the time. I showed Self-Portrait No.2 (Looking at Palestine) at the 2003 Sharjah Biennial and in a subsequent review in Artforum, the reviewer made that reference as well. I wouldn’t be embarrassed to say if I was making a reference to a work and I am not saying this in defence but I didn’t know that work at the time. The specific reference for me was not there but the notions of being small in a big space, insignificant also, are certainly there. That image for me was the most specific for two reasons: it was the first time I had seen Palestine, and secondly, immediately after I took that picture, I was stopped by the police and they questioned me. Taking photographs of yourself in a keffiyeh staring at Palestine from Jordan is apparently a far from innocent activity. It was also an epiphany of sorts, a revelation. I was laughing when you said fear just earlier because there was a lot of fear too about being questioned for 24 hours about that image. But it was also an epiphany because I realised that the keffiyeh has such a strong reference in the Arab mind. It was not just in the western mind that it symbolised terrorism; the Jordanian police felt the same thing. They thought I may be planning a terrorist act or recording a suicide video. 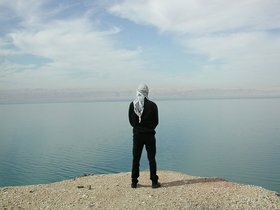 That’s the only image that is titled because the viewer had to know that this was the Dead Sea and that I was looking at Palestine. I think the image changes completely – or does not resonate as much – if you don’t know that. AD: I guess the other point I was trying to make about Caspar David Friedrich’s painting and your photograph is that both suggest a moment of existential crisis. Would you agree with that reading or is it too much? TAG: I think the figure looking out over the Dead Sea, in that light, and in the way it is composed, does touch upon an existential crisis of sorts. The stillness of the water, looking over the shoulders of the figure towards a landscape beyond … all of these existential feelings are triggered and that is why it was problematic for me to only show one or two of the images. If you don’t see them as a group they become very specific and the viewer tends to want definitive interpretations. When you show them in a group, you get a whole narrative, a sense of a story unfolding over time. AD: I also think that when these images are seen separately they look like a provocation – albeit to the viewer and the suggestion that we rethink what we are looking at – and when seen as a group of images, they appear to be more about witnessing. I was reminded of a kind of Handala-like figure, the one created by Naji Al Ali, the cartoon figure of a young Palestinian boy who becomes a witness to history. TAG: I understand the reference to Handala but to the best of my knowledge – and I checked this with an art historian – the figure is always imagined from the back and it is very much about witnessing, whereas the figure in my images changes position: sometimes, it is facing the camera, sometimes shot from the side, sometimes passing through the image as if they are unintentional interruptions. AD: I want to shift a little bit and talk about what is being represented in your B Series (2005-2006). I find them formally more abstract and I am drawn to the topographic element in them. They seem to be about barriers, about points beyond which one cannot travel. I see that as allegorical as opposed to actual. Could you talk a little bit about why you choose to work with these particular objects, which are quite obdurate and wall-like, and yet sculptural too. Tarek Al-Ghoussein, Untitled 7, from B Series, 2005-2006, digital print, 21 5/8 x 29 1/2 inches (55 x 75 cm), edition of 6. Courtesy and © Tarek Al-Ghoussein. TAG: They started out being a reference to the wall in Palestine. 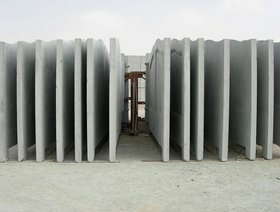 I went through Sharjah looking for a factory that would sell me a piece of wall because I wanted to do something with it, but no one would until I met a Palestinian who managed a local factory. He gave me a piece of the wall and he let me do a lot of the work in his space. In that series, everything was actually constructed. A lot of people think that what they are looking at is an existing construction site, but I also asked for that to be made because I had an image in my head that I wanted to give a reality to. 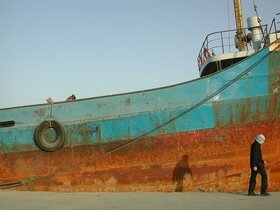 I exhibited the work at the 2005 Sharjah Biennial and I was thinking of ways I could exhibit it. One of the ways was to bring the sculpture of the walls – B Series (Untitled 7) – into the space but the curators said it was too heavy for the space. So then I started to think about walls in general and the best way I could find to do it was to hang the images from the ceiling on rice paper – they made a lot more sense that way as they looked like walls or partitions. The wall in Palestine isn’t just an issue about the wall itself but also about the psychological barrier created between the people on both sides and also the psychology of having a wall in front of you. I started to think about our own psychological walls and how it is much more in the mind than anything else, so I thought about putting the images on rice paper, something that is going to deteriorate over time. When people are in the space, walking amongst the images, they also become part of that wall too – they are there in the shadows. AD: To a certain extent, the formal elements in this work – the use of rice paper and its transience in opposition to the durability of the wall – create tension. TAG: Yes, I would agree with that. AD: Going back briefly, you were arrested after taking the image Looking at Palestine by Jordanian police and that one of the problems was the fact that you have a Kuwaiti passport. You may want to talk about this, you may not, but being Kuwaiti with a Palestinian background, especially in the context of a Gulf state, presents a number of difficulties. For example, we recently ran an interview with Ala Younis, who put together a show called The Museum of Manufactured Response to Absence, which examined the fact that there were originally 400,000 Palestinians in Kuwait and, following the first Gulf War, there are now only 40,000. There is obviously a tension to be had there in terms of one’s identity as a Palestinian in Kuwait – is that the case for you? TAG: Not exactly. The situation with me and the passport was not because I was Kuwaiti. They actually thought I was Israeli – my Arabic, especially when I am nervous, is certainly less than perfect. I am very light-skinned and there are not many Palestinians who have Kuwaiti passports, so they didn’t trust that either. Being there with a keffiyeh and a camera and a Kuwaiti passport didn’t fit for them. They could not imagine that a Palestinian could have a Kuwaiti passport so they thought I was a spy. It had nothing to do with what you are talking about. Not to them at least. AD: Do you think they had a more stereotypical image in their head of what a Palestinian should be? TAG: I think they just didn’t get it. In retrospect, it makes sense because there were a lot of incidents in the weeks before about suicide bombers making videos so they could not understand why I wanted to take a picture looking at Palestine with a scarf wrapped around my head like a so-called terrorist would. They also could not understand why I was doing this in the open and not trying to hide it. It felt a bit like a Kafka novel, because no one would tell me what the issue was and why I shouldn’t be there. They asked me if I could swim and how far I could swim, which began to seem ludicrous, as if I was considering swimming back to Palestine! AD: It’s interesting that you should mention Franz Kafka because in The Trial, the main protagonist not only never knows what law he has infringed but, perhaps as a result of not knowing, begins to imagine not only his potential wrongdoing but actually starts to rationalise his own guilt. At one point he is ready to admit to a crime that he not only doesn’t understand but doesn’t know he has committed. It is as if the accusation creates the actual crime rather than the other way round. TAG: It was a very surreal time and The Trial did keep going through my head. At one point, a policeman asked me ‘Do you know a guy called Ahmed so and so?’ and I said no and they said, ‘Well, we have a picture of you with him in Egypt and he is a member of the Muslim Brotherhood’. Then I started to think that I do know a guy named Ahmed – could that guy work with the Muslim Brotherhood and I just don’t know about it? I started to doubt myself. They had no pictures of anything, of course, and there was no Ahmed, but they were playing these games and I did start to doubt myself. AD: In a way, you were there to take a photo of yourself that does indeed exist and they are trying to create a photo of you that does not exist! TAG: Yes, it was really that bizarre. AD: I recall reading somewhere that in the early 1990s, you worked as a photojournalist taking images in Palestinian refugee camps in Jordan. Tarek Al-Ghoussein, Untitled 11, from C Series, 2007, digital print, 21 5/8 x 29 1/2 inches (55 x 75 cm), edition of 6. Courtesy and © Tarek Al-Ghoussein. TAG: Yes, but I didn’t start off as a photojournalist. I went to New York University and studied fine art photography and did a Master’s as well, but there was a period when I also did documentary work and street photography inspired by the likes of Lee Friedlander, Robert Frank and the whole generation of American social documentary photographers. I started out doing photojournalism because I had graduated, needed a job, and there was no way to go back to Kuwait because there was no opportunity to work there. I couldn’t go back to America because I didn’t have a work permit, so I was looking for ways to make money that also interested me. I also wanted to do a project about Palestinians because it was something that I wanted to understand and investigate. I knew I was Palestinian but I did not fully know what that meant. I saw lots of images in Edward Said’s book After the Last Sky: Palestinian Lives and Don McCullin and Jonathan Dimbleby’s book The Palestinians, but there was nothing that really related to my own experience as a Palestinian. So I went to the camps but I dropped it after a year or two because it was so hard for me to address the range of psychological aspects of being a refugee through documentary photography. You cannot separate or escape the economic situation from the camps and it was frustrating to try and get beyond that. I had nothing in common with these people, really, and I felt it was unfair for me to take the images and potentially objectify their plight. I felt like I was being very repetitive in the work that I was doing. I understood composition and how to capture the right moment but the work was not able to address the deeper issues. AD: Do you think you may have been creating a stereotype there? TAG: It may be impossible to not contribute to creating stereotypes when using still images. AD: That returns us to our opening discussion and the way The War Room actively interrogates the whole issue of stereotypical imagery. I was wondering if that came out of your experience of photojournalism itself, an attempt to, if not compensate, then address what images do and how they are produced and what they do in the moment of production? TAG: Yes, to some degree, the War Room does relate to my photojournalism work, but it allowed me to think more critically about the relation between stereotypical images and the means of production. AD: Could you just very briefly let me know what you are working on presently? TAG: I don’t know if you saw a series that I did called (In)Beautification? I showed some of them about ten months ago in Abu Dhabi at a show called Emirati Expressions. AD: I have seen reproductions. TAG: I am developing that series/work further. It is the first series that I have actually identified with a descriptive title. It is somehow separate. I was in awe and curious about the beautification process that is ongoing in the landscapes of the region, and you talked about the topographic changes and that somehow came back into my psyche. The series is an attempt to negotiate my own relationship to land and place and how the development has formed and continues to form my understanding of what the concept of identity may mean. Tarek Al-Ghoussein is an artist based in the UAE. His work has appeared in international exhibitions throughout Europe, the United States and the Middle East. His work is also featured in several anthologies and a monograph on his work In Absentia was published by Page One and The Third Line. 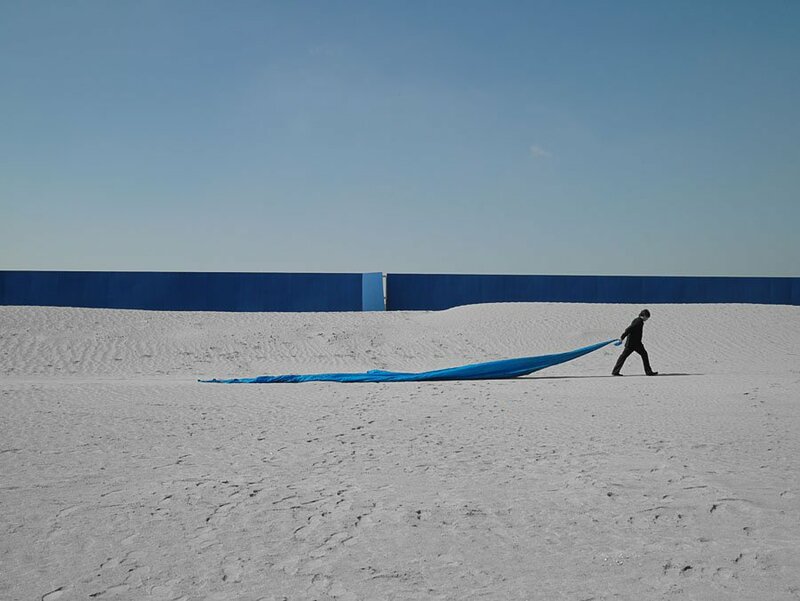 Tarek Al–Ghoussein’s work is in permanent collections at the Solomon R. Guggenheim Museum in New York, the Victoria and Albert Museum in London, the Royal Museum of Photography in Copenhagen, Darat Al–Funun in Amman and Mathaf Museum in Qatar. In the UAE, his work is in the collections of the Sharjah Art Foundation, the Barjeel Art Foundation, the Salsali Private Museum and Rami Farouk Collection. Al-Ghoussein, Tarek. “Stereotyping the Stereotypes: Tarek Al-Ghoussein in Conversation with Anthony Downey.” Interview by Anthony Downey. Ibraaz. Ibraaz, 2 Nov. 2012.